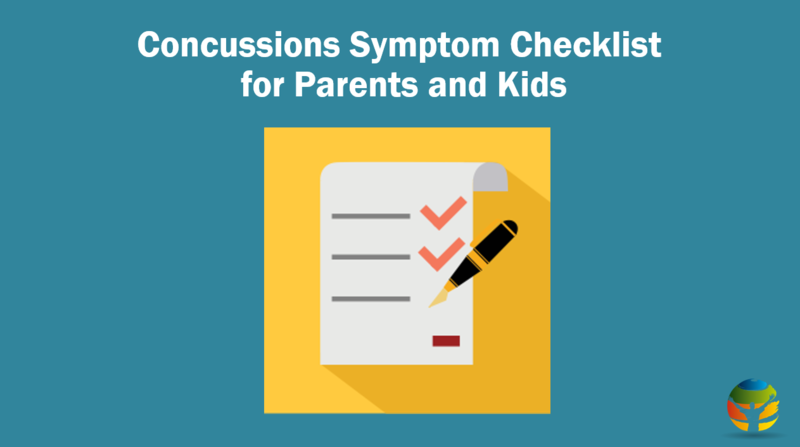 We first began providing comprehensive concussion safety information to youth sports parents, coaches and athletic trainers in 2000. Since the beginning, we have been considered the “pioneer” in concussion safety education. Seventeen years later, millions of sports parents but coaches, athletic trainers, and medical professionals around the world know they can count on us as a trusted, objective, and reliable source for all things concussion, with the MomsTeam Concussion Safety Center growing to become the largest, most comprehensive library of concussion safety information on the Internet. 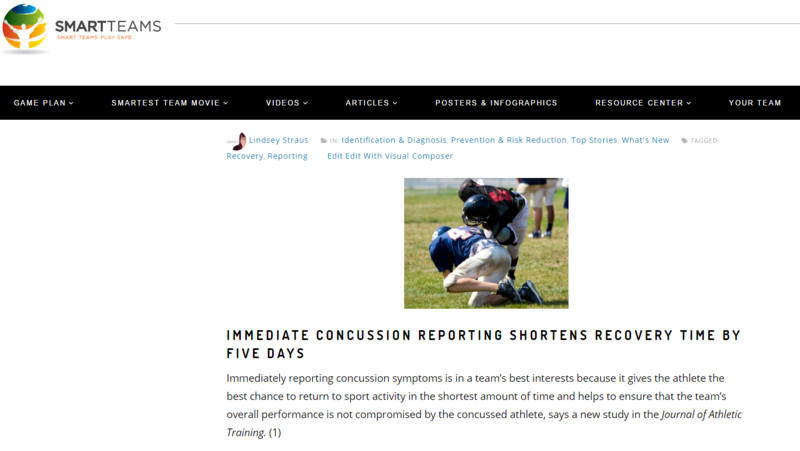 Our team of sports concussion experts, editors, writers, researchers, and videographers are constantly adding to and updating a content catalog of more than four hundred articles and videos to reflect the enormous advances that have occurred in the 2000’s in concussion identification, evaluation, and treatment. MomsTEAM and SmartTeams™ have long been enthusiastic supporters of the outstanding efforts by the Centers for Disease Control and Prevention’s Division of Unintentional Injury Prevention of the National Center for Injury Prevention and Control to educate coaches, athletes, parents, clinicians, and schools about head injuries through its Heads Up program, which studies have shown to be effective in increasing awareness about all aspects of concussions, from prevention to treatment, return to learn, and return to play, including the dangers to athletes of continuing to play with concussion symptoms and of returning to contact or collision sports before their brains have fully healed. Like SmartTeams™, the CDC is now recommending that the best way to reshape the culture around concussions in sports and increase the chances that an athlete will engage in positive concussion symptom reporting behavior is by employing a new approach: one which, as with our #TeamUp4ConcussionSafety program, moves beyond concussion education focusing primarily on educating athletes about concussion signs and symptoms and the dangers of head injuries to an education model emphasizing that all stakeholders (coaches, athletes, parents, medical personnel, and, even spectators) need to work as a team to create an environment in which athletes feel comfortable reporting, encourage teammates to report and support them when they sit out with concussion. Like the CDC, SmartTeams™ believes that reshaping the culture of concussion safety must ensure that athletes receive consistently positive messages, and even praise, from coaches, parents, teammates, and medical staff for concussion symptom reporting (and, conversely, do not feel pressured to hide their symptoms), and are made to feel comfortable possible symptoms of concussion. 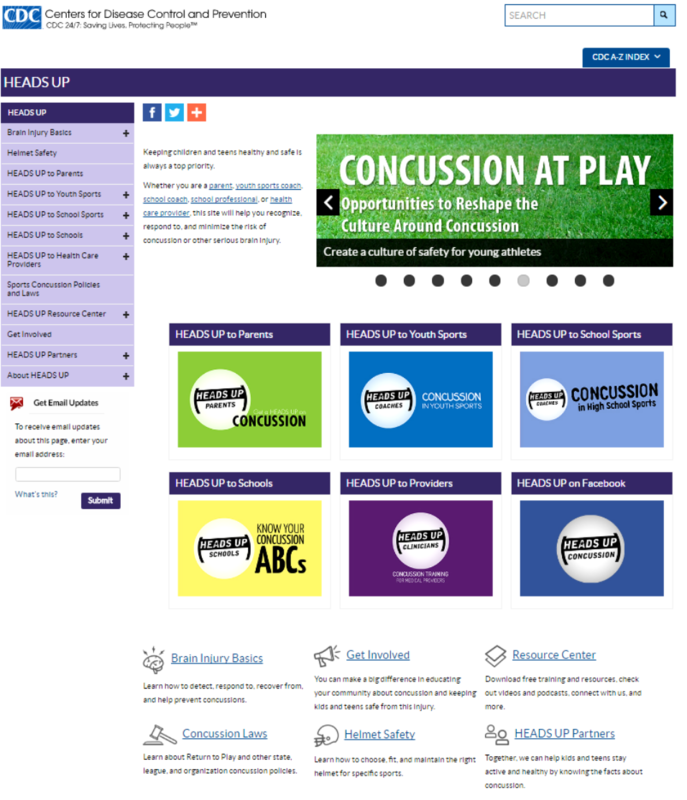 Not surprisingly, our #TeamUp4ConcussionSafety program includes many of the key message points and action steps, and is grounded in much of the same research, as the CDC includes in its outstanding Concussion at Play report. which provide a snapshot on current research on concussion knowledge, awareness, attitudes, and behaviors. But we also believe at SmartTeams™ that, in order to change the culture of concussion safety, we need to go one important step further than the CDC’s current recommendations in order to reshape the culture around concussion in sports: not only working to increase concussion symptom reporting by changing the way we talk about and respond to concussions so that athletes know they cannot play with a concussion or hide their symptoms, but by making a direct, pragmatic appeal to a coach, an athlete, and a team’s interest in achieving individual and team goals, including winning: by minimizing the chances that the overall team performance will suffer because a concussed athlete continues to play, while maximizing the chances that the athlete will be lost to the team for the shortest period of time after a head injury, immediate concussion symptom reporting is in the best interests of the athlete, team, and coach and should be viewed as the sign of a good teammate. MomsTEAM (soon to become SmartTeams™) has been producing concussion education videos for over a decade, featuring such prominent concussion experts as Dr. Robert Cantu of Boston University and Emerson Hospital (our first concussion expert, 2001-2007), Dr. William Meehan, former Director of the Sports Concussion Clinic at Boston’s Children’s Hospital and currently director of the Micheli Center for Sports Injury Prevention at Children’s, Dr. Rosemarie Scolaro Moser, Director of the Concussion Center of New Jersey, and a member of the Centers for Disease Control and Prevention’s Pediatric Head Injury panel, and Dr. Elizabeth Pieroth, a sports neuropsychologist at North Shore Medical Center in Chicago and a consultant to a number of the city’s professional sports teams. A curated selection of the best of those videos can be found in the Videos section of this site. 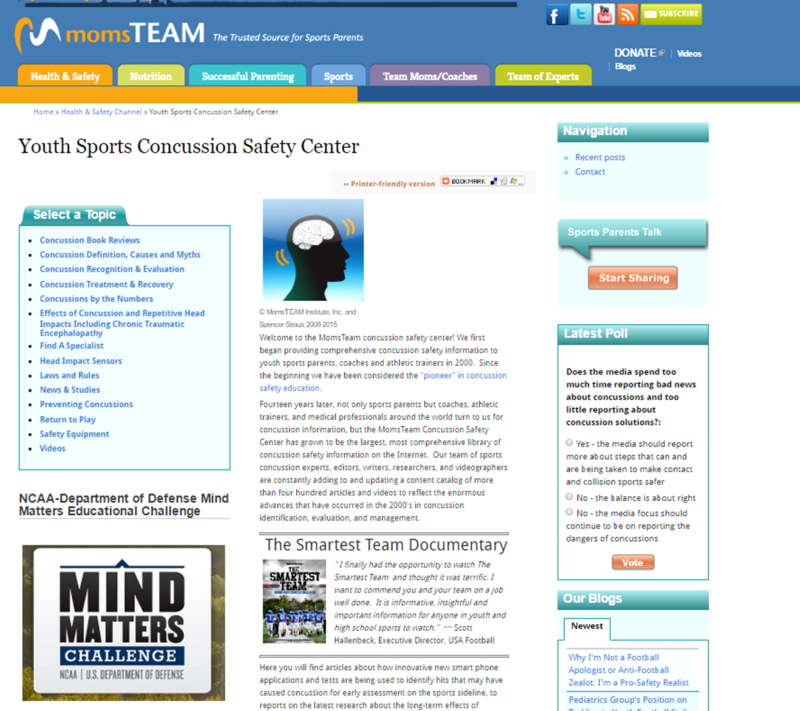 In addition to articles and blogs from our editors and team of concussion experts reporting on the latest developments in the ever-changing world of head injury research, the SmartTeams™ concussion site will bring to you a curated selection of articles and blogs selected by our editors from the thousands of pages of concussion content on our legacy MomsTEAM site. 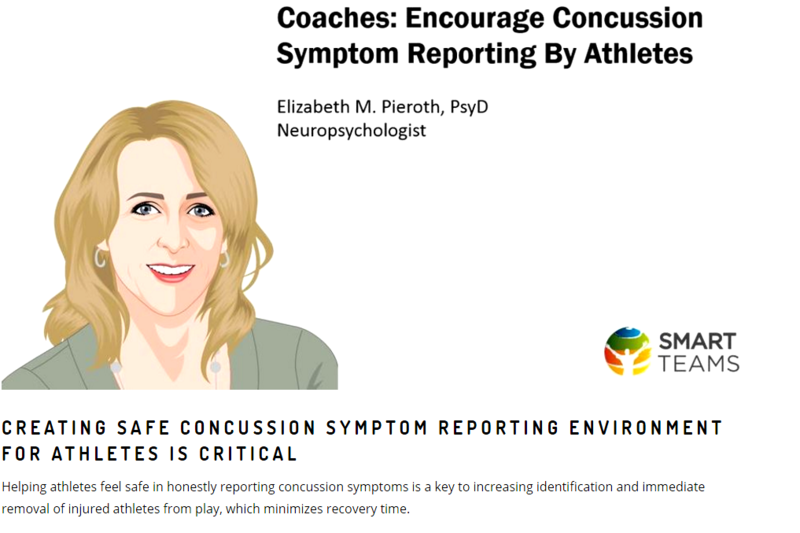 In addition to the CDC’s library of fact sheets and handouts, SmartTeams is producing its own fact sheets, handouts, infographics and posters for coaches, parents, and athletes about concussion safety, from tips on reducing the risk of concussion and injury from repetitive head impacts, to advice on how all stakeholders can work together to create an environment in which athletes feel comfortable reporting concussion symptoms to a coach, parent, or medical personnel, from the ever-evolving best practices for treating and managing a concussion to return to learn, return to play, and retirement.